Television and popular music, or rock’n’roll as it was once known, have grown up together – both taking their formative steps in Australia in the middle twentieth century. Given that a lot of early television programs were live to air — videotape was still a few years to come — it was probably no surprise that some of the earliest shows of light entertainment were based around pop music or the ‘hit parade’ as it was known then. The first program dedicated to playing popular music was TCN9 Sydney’s TV Disc Jockey hosted by John Godson, a program which evolved from TCN’s early test pattern broadcasts which included various music selections. 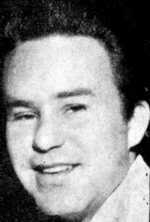 TV Disc Jockey was the predecessor for what would become one of Australia’s first national TV shows, Bandstand. In Melbourne, HSV7’s first foray into popular music was the weekly program Teenage Mailbag featuring a young Ernie Sigley with co-stars Heather Horwood and Gaynor Bunning performing songs on request. 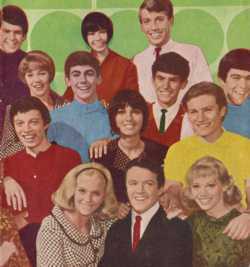 At around the same time was The Hit Parade, and a similar program also existed in Sydney, where local performers would mime – sometimes in time with – the latest hits. GTV9 responded with a rival program The Astor Show. As television began into the other cities so did local pop music programs such as Perth’s Club Seventeen, Brisbane’s Your Hit Parade and Club Seven and Adelaide’s In Time. Even regional stations — which popped up during the 1960s — were producing their own local pop music programs, including Tempo (NBN3, Newcastle) and Teen Time (GLV10, Gippsland). By the end of the ’50s, two very different but both influential programs on pop music had launched in Australia — Bandstand and Six O’Clock Rock. While earlier pop music programs usually consisted of local performers miming to hits of overseas artists, Bandstand and Six O’Clock Rock would be Australian television’s first major outlets for local artists and performers and whose reach would extend beyond the Sydney-Melbourne markets. Bandstand, hosted by the very neatly-dressed and well-spoken TCN9 newsreader Brian Henderson, was largely based on the popular American program of the same name. As well as featuring a constant string of guest performers, Bandstand established its own stable of regulars, some that would become household names such as Peter Allen, Col Joye, Olivia Newton John, and the Bee Gees. At the opposite end to the conservative Bandstand was ABC’s Six O’Clock Rock which began in 1959 and hosted by Australia’s own ‘wild one’ Johnny O’Keefe. Six O’Clock Rock, largely due to its host, had a certain rebellion in contrast to the polished production values and the family atmosphere of Bandstand. It was quite surprising that the public service broadcaster ‘aunty’ ABC would embark on such a radical program format though Six O’Clock Rock would prove to be only the first of such ventures for the national broadcaster. O’Keefe moved on from Six O’Clock Rock by 1962 and the program did not last long beyond that. Bandstand however would continue until the early ’70s. In 1964-65, the new 0-10 Network had emerged and with it came a resolve to appeal to younger viewers. The first program to target the teenage baby boomers was Go! !, produced at the studios of ATV0 Melbourne. Go!! was initially hosted by Alan Fields, later replaced by Ian Turpie and Ronnie Burns. While Bandstand featured predominantly Sydney artists, Go!! was heavily focused on Melbourne performers. Go!! was the first in a string of national pop music shows from 0-10. It would be followed later in the decade by Kommotion, the Saturday morning program Uptight, and Happening ’70 (which became ’71 and then ’72). By 1967, TV Week and the 0-10 Network initiated the King Of Pop Awards, inviting TV Week readers to vote for their favourite artists. 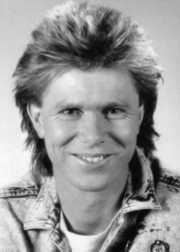 Normie Rowe was the first to be voted Australia’s King Of Pop but it was John (then Johnny) Farnham that really made the title his own, winning the award five times before the awards wound up in the late ’70s. In 1969, ABC would continue to cover the music scene with GTK (Get To Know) a ten-minute program screened weeknights at 6.30pm. Comprising a mix of interviews, magazine-type stories and ‘film clips’ to hit songs that would be the predecessor to the video clips that are commonplace today. The next few years would see a generational change with the eventual demise of Bandstand in 1972, and two years later the launch of what was quite possibly the most iconic television program in Australian pop music culture — Countdown. Countdown, another product of ‘aunty’ ABC, began on 8 November 1974. Initially intended to run as eight half-hour episodes on a Friday night, the new show would feature both studio performances and video clips of the hits of the day. The program was produced at ABC’s Ripponlea studios in Melbourne and was allowed to air in colour as part of ABC’s testing of colour transmission. Producer Michael Shrimpton told Melbourne newspaper The Sun that it was hoped that if successful, Countdown would continue in 1975 in a weekly 55-minute format. Even before those eight weeks had passed, Countdown had already proven to be a success and a sure sign of ABC’s support of the program was their decision to feature Countdown‘s debut for 1975 as the first program to be screened on the launch of full-scale colour transmission at midnight on 1 March 1975. That historic first 1975 episode was hosted by the ‘King Of Pop’ Johnny Farnham and the first act to appear was the infamous Skyhooks fronted by Graeme ‘Shirley’ Strachan. The program then settled into its regular timeslot, Sunday night at 6pm, where it would dominate for years to come. Countdown quickly became the program that could make, or break, any local or overseas act in Australia and epitomised the booming music scene of the 1970s. Screening on the national broadcaster ABC, with transmitters spread across the country, the program had an audience reach that no other medium, including commercial television, could dream of matching and this gave the program unprecedented influence over the record buying public. An instrumental part of Countdown‘s success was Ian ‘Molly’ Meldrum — a former contributor to earlier shows such as Kommotion and Uptight, and a writer for pop music magazine Go-Set. Meldrum became Countdown‘s talent co-ordinator and chief presenter. His passion for the music industry and close rapport with both local and international artists helped make Countdown a Sunday night institution for over a decade. Also launched in 1975 was the Seven Network’s Sound Unlimited, hosted by Donnie Sutherland and produced by Graham Webb. Sound Unlimited (the title later shortened to Sounds) screened for three hours every Saturday morning featuring a mix of live performances, studio interviews and video clips. Though Sounds could never claim the same influence or popularity as Countdown, both programs dominated the Australian music television scene for the next decade. As the 1970s came to a close, niche music programs such as Nightmoves (Seven Network, and later Network Ten) and Rock Arena (ABC) would provide a somewhat more mature approach to music television with more in-depth discussion and interviews and a more diverse range of music that would normally be at odds with the mainstream shows like Countdown. Part of the successful formula for shows like Countdown and Sounds was the music video clip. Video clips were a rarity in the mid 1970s but thanks to shows like Countdown and Sounds they were becoming increasingly important in order for record companies to promote their latest releases, particularly for overseas acts wanting exposure but for which distance precluded frequent visits to Australia for live appearances. The success of Countdown led to the Nine Network in 1976 reviving its former hit show Bandstand, this time hosted by Daryl Somers. However, the revival was short-lived as Bandstand 1976-style failed to match the chemistry of its predecessor or its rivals. 1980 saw the advent of multicultural television through Channel 0/28 in Sydney and Melbourne. By 1982, the new station would provide yet another perspective on pop music television with Rock Around The World hosted by Basia Bonkowski. The program featured interviews and video clips from a range of countries rarely featured on Australian television up until that point. 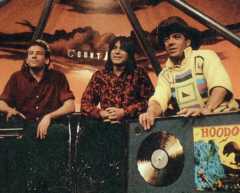 Rock Around The World was the first of several music programs to feature on what is now SBS with later programs including The Noise, Kulture Shock, MC Tee Vee, Nomad, Alchemy and Noise TV, all of which would cover their own niche as an alternative to the mainstream genres covered by commercial and ABC television. The early 1980s also saw the former King Of Pop Awards revived as the TV Week Rock Awards produced in association with Countdown and would be the predecessor to Countdown‘s own music and video awards later in the decade. The TV Week Rock Awards were a combination of public voted and industry voted awards. While the mid-Seventies saw a generational change in pop music television, the same would happen again by the late 1980s. As AM radio was being overtaken in popularity by FM, and as vinyl records were replaced by compact discs and ‘walkmans’, studio productions like Countdown were losing favour with the public who were becoming more interested in music video clips rather than live performances. Television networks also liked music videos because they were cheaper to put to air. The advent of cable channel MTV in the US, with wall-to-wall music videos, was also to have an influence in Australia. In 1987, no less than four music video programs were launched on Australian television — Video Hits (Ten), Rage (ABC), Nightshift (Ten) and an Australian version of MTV on Nine — filling up many hours of airtime each week. Faced with this unprecedented level of competition, Countdown was reworked when it launched for the 1987 season. Gone were the colourful sets, the emphasis on studio performances, and voice over man Gavin Wood, and in their place was Countdown Pirate TV, or CDPTV. The new format was predominantly based around music videos, accompanied by a rather morbid skull and cross-bones logo and a grim computer-generated voice over, to give the impression that ABC had been ‘hijacked’ by a pirate television station. Viewers turned away in droves and it was not long before Countdown had to revoke some of its changes, however it could be said that by this point the damage was done. Countdown never recovered from the CDP experiment and on 25 June 1987, ABC announced the program had been cancelled. However, just as it launched with a bang in 1974, Countdown was destined to go out equally as loud with the 1987 Countdown Music And Video Awards serving as the show’s final episode on 19 July. John Farnham, who was there in Countdown‘s earliest days, was there again at the finale, and host Molly Meldrum provided the show’s ultimate punchline by removing his trademark cowboy hat, revealing a bald head underneath. However while Countdown tried to fight the music video revolution with more of the same, Sounds did the opposite, going against the trend and concentrated more on live performances. The new direction of Sounds was also taken in response to the recording industry’s controversial new ‘pay for play’ policy, where TV stations would have to pay for the video clips that they aired. However just as Countdown came to an end in 1987, so too did Sounds shortly after, bringing to an end an iconic era in Australian television. Molly Meldrum soon took his role as music ‘guru’ to Nine’s Hey Hey It’s Saturday, and Sounds‘ Donnie Sutherland moved to satellite channel Club Superstation, a predecessor to Sky Channel. Three months after Countdown‘s demise, ABC launched a new Saturday morning program The Factory. Hosted by Andrew Daddo and Alex Papps, the program was a mix of music videos, studio performances, interviews, comedy sketches and magazine segments covering topics such as fashion, movies and other pop culture. Despite its cult following, The Factory lasted barely two years, ending its days in a Sunday morning timeslot. Replacing The Factory on 3 July 1989 was Countdown Revolution which aimed to revive some of the hysteria of the Countdown era. Screening weeknights at 6.30pm on ABC, Countdown Revolution featured some aspects of the former Factory, including comedian Tania Lacy, and studio segments were taped in Melbourne’s popular Metro nightclub. The show’s timeslot did it no favours however, slotting it up against popular teenage soap Home And Away on Seven and the top-rating A Current Affair on Nine. ABC consequently moved the program to 6pm and production of the studio segments moved from the Metro back to the Ripponlea studios. Also gone were hosts Andy McLean, Dan Woods and Lisa Collins — replaced by Tania Lacy and Neighbours actor Mark Little who took a more anarchic approach to the program. The changes were not enough to save the program and it soon disappeared. The end of Countdown and its music awards virtually coincided with the launch of the ARIA Awards by the Australian Recording Industry Association. 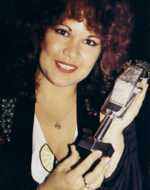 Unlike its predecessors, the ARIAs were awarded according to industry votes and on record sales. They began as a relatively low-key event among industry identities and it was 1992 before the awards would be televised, initially on the Nine Network and later Network Ten before alternating between the two networks. Network Ten made further attempts to revive the Countdown formula, including Take 40 Australia (produced in association with the syndicated radio program of the same name) and The House Of Hits with Meldrum reprising his former Countdown role, with co-host Leah McLeod. Pay TV began in Australia in 1995 with operators Foxtel, Galaxy and Optus Vision, and music channels featured from the beginning. Dedicated music video channels such as ARC and RED were part of the initial line-ups, but would later make way for the likes of MTV and Channel [V]. Not unlike The Factory was another ABC program, Recovery, which made its debut on 20 April 1996. The host was a then unknown Dylan Lewis and the program, produced live to air from ABC’s Ripponlea studios on Saturday mornings, featured a mix of live performances, video clips and other pop culture of interest to a teenage audience. Recovery was an alternative to the decidedly mainstream Video Hits on Ten but would run for only a few years, making its final appearance on 29 April 2000. Lewis went on to host Network Ten’s Sunday night pop music program Pepsi Live. Into the twenty-first century Video Hits and Rage continued as the flagship music programs on free-to-air TV — and dedicated pay-TV music channels including MTV, [V] and VH1. In 2005, MTV launched the first MTV Australian Video Music Awards. The emergence of reality TV has also extended to including the music industry, providing a new twist on uncovering new talent — first with Popstars on the Seven Network in 2000, and then Network Ten adopting the Pop Idol franchise with Australian Idol from 2003. Both programs generated top-selling albums and singles releases though the longevity of graduates from these shows is perhaps yet to be seen. Can you please tell me when Countdown was held in Adelaide on the banks of the river Torrens and the Festival Theatre? Where can I find a copy of the video recording? I remember Little River Band and Dragon played live. Who else played live that night. You may need to contact ABC or the National Film and Sound Archive, although it is known that many Countdown episodes no longer exist anywhere. There are also issues of copyright involved particularly with music tracks.